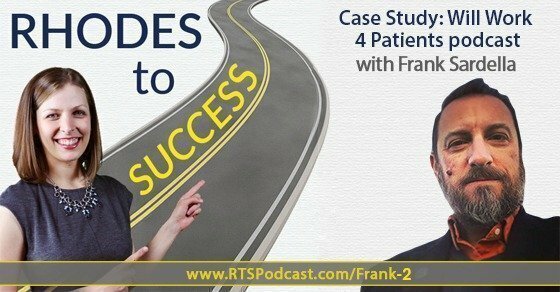 On this episode of Rhodes to Success I interview Frank Sardella who uses his podcast Will Work 4 Patients a way to market his chiropractic business. This episode is another in the case study series as Frank and I discuss how important your backstory is in positioning yourself as an expert, the importance of the niche, whether or not to create a pilot episode, predictability and evolution, and monetization. What is your business and how do you make money? Who are your clients and when did you start your business? What was the turning point of getting into podcasting? What were your expectations going in and how did your perspective change the longer you podcasted? Why did you create a pilot episode and do you think it’s a good idea? Do you see as podcast sponsors as distracting the audience from what you do? Frank got started in chiropractics after a chiropractor saved his live more than 20 years ago. Within 3 months of taking a job at the chiropractor chain he was promoted to the role of director of marketing and learned the ropes of the industry. Frank decided to help thousands of chiropractor help their patience in order to have a bigger impact and help millions of people. He connected his art, advocacy and public speaking and expanded to modern wellness professionals. Frank has a system of face-to-face marketing and e-marketing, which is the model of his business on how he generated revenue. In 2011 Frank discovered online conferencing, which revolutionized the business and enabled him to work with people globally. When you use a podcast as a marketing tool you need to position yourself as an expert and let people know what you do. When people consider working with you they want to know who you are as a host, your backstory and if you are credible. In order to have credibility you need to put some of yourself into your show and demonstrate passion and purpose to the listener. Its not enough to say you just want to do a podcast you have to have something to give. You have to have a niche and avoid being general. In radio you do a live broadcast and it’s gone forever. With a podcast, you do an episode and it’s there forever. Many podcasters use elements from different media in each show. It took Frank 2-3 years of recording 20-30 episodes to just get the show well and truly rolling. The podcast isn’t about getting coaching clients first, its about getting listeners and readers of the blog. Podcasting is about providing so much value that it brings people into your community. From the time you start to when you see the results could be an obscenely amount of time. Pilot episodes help create the platform and enable you to figure out where you want to go from there. Glean format from other podcast rather than content. After about 5 episodes you need to get into a rhythm and be consistent with the format. Every episode should be predictable. It’s important to evolve and let the show go where it will go. The biggest evolution should be due to feedback. You have to be okay with testing something and it not being a good idea. Frank had the idea of affiliate marketing before he had the idea of the podcast. The types of affiliate relationships you want to build are those that come through you but build the relationship you already have. If the client wins then you win. Can you expand on your niche and make it valuable to the sponsors?